It sounds like a futuristic idea. A drone fitted with advanced radar and artificial intelligence that scans airspace for miles to determine if another drone with ill intentions is in sight. Then, it captures it with a high-speed net, tethering it away to a safe location. Well, the future is here. A company located in Pleasant Grove, Utah has come up with an innovative approach to protecting airspace against rogue drones. Fortem Technologies secures airspace around airports and large spectator events, so drones are detected if they’re flying in a no-fly zone. The technology, called Fortem SkyDome, is based on small, powerful radar and software that digitizes the airspace over a specified area or an urban environment. The digitized airspace ensures safe operations of air taxis, public safety drones, drone package delivery systems, and more. “There are life-saving services that forward-thinking cities are implementing while helping the environment, reducing traffic, and increasing the quality of life.” Said Timothy Bean, CEO of Fortem Technologies. The digitized airspace quickly identifies rogue drones. Once something is detected, the DroneHunter is cued to launch and pursue the rogue drone and remove it from the no-fly zone; all autonomously. Fortem’s innovations have caught the attention of companies like Boeing and other investors, raising over $20 million. The company sells its solutions to the U.S. Department of Defense, major airports, prisons, and sports stadiums to protect soft targets from air-based threats. “More public services are incorporating airspace tools into their operations. 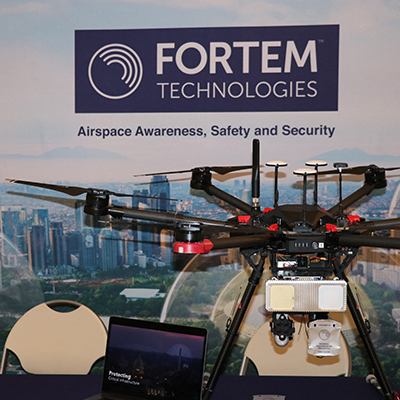 Fortem is eager to help provide the most advanced solutions possible to monitor the airspace for safe operations while protecting us from careless or criminal drone operators,” says Bean. 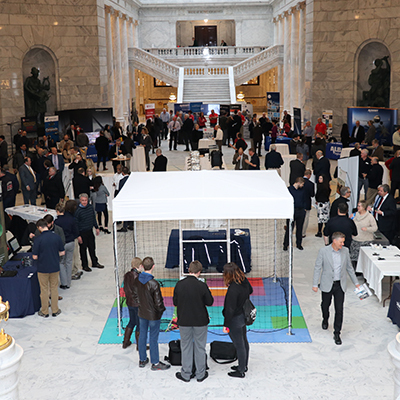 Aerospace Day on the Hill. Fortem Technologies uses a small, powerful radar and software that digitizes the airspace over a specified area called Fortem SkyDome.